On my recent trip to Cairo I spent a week at the American University of Cairo participating in a week-long professional development conference for Palestinian educators. The conference included educators from five different Palestinian universities—many of whom were meeting for the first time in Cairo, despite working and living in the same city. 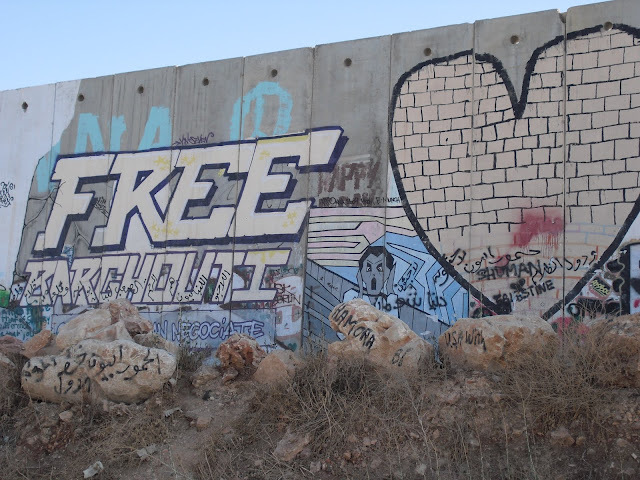 The experience brought me back to last summer’s visit to Palestine, which I wrote about here. Interacting with my Palestinian colleagues in a (relatively) free country was stimulating and engaging, but I was haunted by thoughts of the oppressive conditions back home they would soon return to. The conference was organized around establishing centers for academic excellence with a focus on the role of new media in supporting teaching and learning. My Columbia cohorts and I presented a keynote on Media Analysis and Social Pedagogy (Frank’s intro, Part 1, Part 2), and throughout the week we discussed the interplay between technical and pedagogical innovation. The elephant in the room was the desperate condition of basic telecommunications infrastructure in Palestine—it’s difficult building a curriculum around blogs or wikis when Palestinian connectivity in the West Bank is notoriously unreliable—even when it works, it’s slower than dial-up. The real tragedy is this digital divide is artificially manufactured and brutally enforced. Last summer I had a better connection over complementary wifi on an Israeli Egged bus than at the Palestinian University PTUK. When I visited Palestine I experienced the reality of the occupation first hand. I have written about how so many aspects of life—fuel, electricity, food, water, mobility, connectivity—are regulated and controlled. As I learned last summer, the Israeli government forbids Palestinian telecom from developing 3G networks, prevents the Palestinian Authority from laying fiber between cities or connecting directly to the Mediterranean backbone, and businesses have a very difficult time importing routers. At the same time, the Palestinian activists who are trying to develop free municipal wifi in Ramallah are being thwarted, but not by the Israeli government. They are facing staunch opposition from Palestinian Telecom corporations. I have come to realize that the forces of the Occupation are on a collision course with Capitalism. There is simply too much damn money to be made on data plans and broadband. I also believe the Israeli government has read The Net Delusion, and are arrogant enough to think that they can control the situation by surveilling it. The IDF is agressively targeting media networks. Ultimately, I think they will allow this infrastructure to be built, making it all-but-inevitable that better ICT infrastructure is coming to Palestine. The questions are: What will the Palestinians do with it when it arrives? Can government surviellance contain the power redistribution that networked organizing tantalizingly promises? One of the key themes of our keynote at AUC was the importance of developing meaningful superstructures on top of technical infrastructure. At the conference we explored ways in which educational technology could be combined with teaching strategies to support peer-to-peer learning, the flattening of traditional classroom hierarchies, the displacement of conventional teacher-student power relations, and authentic learning activities. Of course, educational technology alone won’t bring these outcomes. In many situations educational technology serves to perpetuate and reinforce the status quo. These cultures of practice could spread further and faster if the Palestinians learn from our blunders, and create Freedom in their Cloud. As this infrastructure is imagined and built , there is an opportunity to leap-frog over our mistakes and develop an distributed network architecture, instead of the centralized architecture we have fallen for. Imagine a Palestinian mesh-based cloud, running peer-to-peer social networking services. Such a vision is not a pipe dream, in the age of the Freedom Box, Mondonet, and Diaspora. Short of fulfilling this dream entirely, it would be tremendous for Palestinian educators to develop their own, local, free/libre, educational software services instead of relying exclusively on free-of-charge centralized corporate solutions—like Google, Facebook, and Twitter—that render their students into products. Over the week of the conference, as I learned more about the situation at my colleague’s universities, I realized that few of the eleven universities in the West Bank would have the necessary resources to adequately support a new-media teaching and learning center. A well functioning center needs to staff systems administrators, programmers, designers, and video specialists to support the needs of the educational technologists, and in turn, the faculty and students. However, while no single university could support a center like this, I began to wonder how the Palestinian universities might coordinate and pool their resources. Establishing an single independent institution (likely a technical NGO) that services all of the Universities in Palestine, and perhaps even all of the schools in Palestine, might be the next obvious step in the educational capacity-building project that I have been involved with. I have encountered a similar model elsewhere. Groundwire (formerly One NorthWest) is a US non-profit that was launched with the intention of exclusively servicing environmental organizations in the Pacific North-West. A similar kind of organization could be established in Palestine to service the educational sector with educational technology solutions. An institution like this could function of a hub, mediating interactions between different Palestinian Universities, sharing successes and failures, while continually building local institutional knowledge. Unlike the One Laptop Per Child project, this effort would be conceived from the start with training, support, and local engagement. It’s all about developing cultures of practice, and sustainable models for the deployment of infrastructure and superstructure. 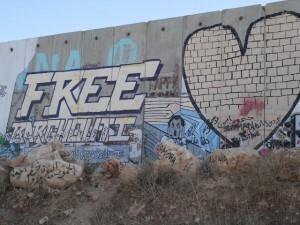 Will the immanent Palestinian networks lead to greater freedom? Maybe. Perhaps with enough will, determination, and work. The iron is hot. if there could be a local server for social networking(Diaspora), wikis, blogs, status updates(statusnet), which would generate communication inside the territory, would this not be useful in itself? There are different OLPC pilots, some small and some large. OLPC does provide some training but not enough. The large pilots setup their own infrastructure to continue this. They do connect with local communities. For small pilots, an OLPC volunteer may be the sole person to coordinate the local team to mobilize all that is required, its a big challange. For large pilots, they start with the government and then work-out the finer points. As for sustainability, large deployments have to do this and last through changes in political leaders. for smaller pilots, it means the olpc volunteer has to check back in on a periodic basis (eg. once per month or ever few months) and pay for necessities as they are needed — power strips, housing, stipends for extra help.